Have you ever thought about growing Shitake mushrooms? I have always love mushrooms. In the spring I walk the woods looking for the wild ones. They are so good to eat; breaded and fried, mixed with scrambled eggs and so many other ways. Several weeks ago Brother Jake sent me one of the best food gift ideas (as he often does). This idea was growing Shitake mushrooms. I received a box from Fungi Perfecti inside a Shitake mushroom kit. You know, mushrooms are a good substitute for meat and they are so delicious. They are very low in calories and offer so much nutritionally. Providing supplements like potassium, calcium, selenium, vitamin C and others, they are great. If you like Shitake mushrooms you may like to try the Morel mushrooms which can be found wild like asparagus. 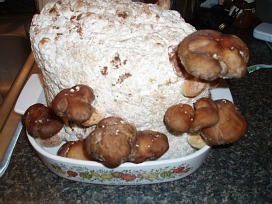 Asian countries have long been growing Shitake mushrooms as well as many others. Mushrooms have served as a staple to their diets because of the many health benefits. Japanese studies have shown that mushrooms have favorably influenced their immune system. Anyway, I was so excited about getting started growing shitake mushrooms. Following the enclosed instructions, I placed the patch still in the box (about 1 foot square with popcorn looking finish) in the refrigerator for 5 days. I removed the box from the refrigerator and removed the patch from the box. 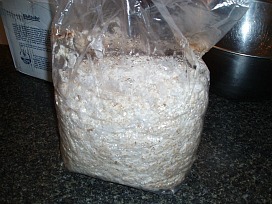 I was instructed to soak the patch for 2 to 4 hours, then place in a shallow dish and cover with enclosed plastic bag. Honestly, I was wondering how this could produce mushrooms! Still following instructions, I removed covering every day and misted the patch. All of a sudden after a week growing Shitake mushrooms all over this patch became reality... Amazing! They grew as you watched. I never show anything grow so fast. Soon it was harvest time. I had to cut off the mushrooms or I would not be able to get the tent back over the patch. After harvest you let the patch dry out for about 2 weeks (this is where I am right now). In a few more days I will poke 3 holes in the top and soak the patch again. Then it will be time for the mushrooms to grow again; and harvest again. This has been a wonderful gift for me. It would make a great unique Christmas gift if you have someone on your list who is interested in food gift ideas. Combine 2 ½ tablespoons soy sauce, 1 ½ tablespoon vinegar and sugar; stir until sugar dissolves. Pour marinade over chicken in a shallow dish; stand at room temperature for 30 minutes turning once. Slice caps of mushrooms thinly (I save stems to make mushroom soup). In a large heavy skillet stir fry mushroom slices and garlic in very hot oil for 1 minute. Add broth and 2 tablespoons vinegar; stir fry until mushrooms are soft and liquid has evaporated. Stir soy sauce into mushrooms and keep warm. Drain marinade from chicken; broil chicken 12 to 15 minutes on each side making sure it is cooked through. Cut chicken breast into thin slices and arrange on platter; top with mushrooms and sauce. STEAK AND MUSHROOM RECIPE My experience growing Shitake mushrooms made this recipe extra delicious. In saucepan blend ketchup with beef broth; add fresh mushrooms and simmer 15 minutes. Cut onion and green pepper in ¼ inch rings; set aside. Cut steak into strips 2 inches long and ½ inch wide; brown in Dutch oven in hot oil; set aside. Remove mushrooms from broth mixture and set aside. Combine flour, soy sauce and black pepper; quickly whisk into broth mixture stirring and cooking until thickened. 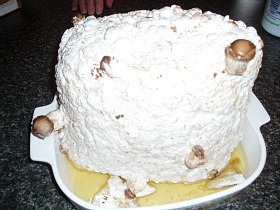 This is one of the delicious recipes I made when growing shitake mushrooms. This light consommé recipe is very flavorful; it is perfect to serve with a heavy meal. The cellophane noodles are available in many grocery stores in the Asian section or in Asian markets. Peel carrots; cut 2 into 2 inch thin julienne strips; set aside. Cut 2 carrots into large pieces and put in stock pot. Add to stockpot the water, wine, mushrooms, onion, celery, ginger and garlic; set on high temperature. Bring mixture to a boil, reduce heat and simmer for 1 hour. Soak noodles in warm water for 30 minutes. NOTE: I cut some of the mushrooms up in small pieces and added back in with the noodles. Heat the consommé; strain the noodles. Cook until the noodles are tender about 3 minutes; add soy sauce, rice vinegar and sesame oil. Just before serving add scallions, red pepper and jalapeno.